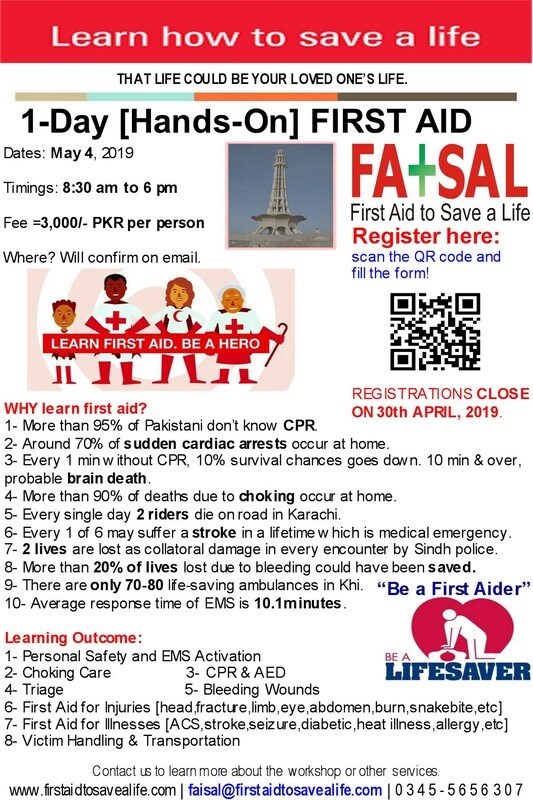 First Aid to Save a Life Pakistan is committed to quality of education and training which involves using premises that are conducive to learning. We are committed to provide sufficient range of equipment and supplies to support all elements of the training program. 2:- Writing surfaces Adequate for each student to take notes. 5:- CPR manikins (or AED) One manikin to every six students. AED for AED trainings. 6:- Training supplies Sufficient quantity (at least two pairs of) gloves, masks, bandages and other supported training supplies. 7:- Optional equipment a) portable BP apparatus. b) portable blood glucose monitoring apparatus. d) First aid box for inventory and refilling practices.